Wright’s Tire Rubber Modified Asphalt Cement (TRMAC™) Technology is an absorption process that completely digests and incorporates recycled, whole scrap ground tire rubber into asphalt cement. 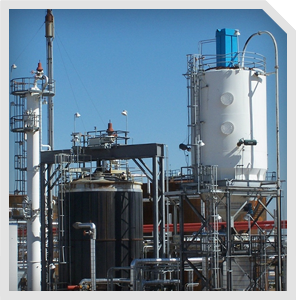 The TRMAC™ system is manufactured within a terminal facility environment, which provides the ability to control the quality of the entire process and certify the end-products. Wright’s laboratory facilities provide the structure to continually test, quality control and certify 24 hours a day, which assures excellent consistency in processing and in the final products manufactured. The TRMAC™ process provides the building block for all of Wright’s Terminal Blended tire rubber modified asphalt products. The process meets ASTM Solubility Specifications and can be formulated to meet any PG-Grade Super Pave Specification. The products created with the TRMAC™ process are compatible with and are a plasticizer for additional polymer modifications. Styrene-Butadiene-Styrene polymer (SBS) is used in some TRMAC™-based products to enhance the elastic recovery and ductility strengths of the finished product. The SBS polymer in combination with the TRMAC™ process produces a finished product that adds greater adhesive strengths to roads and aggregate surfaces, maintaining a tough bond and cohesive strength over time. Products created with the TRMAC™ process exhibit excellent resistance to high temperature rutting and aging while still maintaining cold temperature flexibility. The TRMAC™ process was developed to produce higher-quality products that last longer and provide superior performance. The TRMAC™ is then blended into various finished tire rubber products, which are used for pavement maintenance (high performance chip seals and surface sealers) and construction (high performance hot mix binders). The TRMAC™ process disperses a 25% concentrated tire rubber particle into asphalt cement at a size that is measured between 0.5 to 1.0 microns. See how the particle size distribution compares TRMAC™ to other materials in the chart below.